Qantas CEO Alan Joyce and Air New Zealand CEO Christopher Luxon announce the landmark codeshare deal in Sydney. Photo: James Wilkinson. Rival airlines Air New Zealand and Qantas have today (June 1) announced plans for a reciprocal codeshare agreement that the carriers say “leverages the strengths of each carrier’s domestic networks, making travel within Australia and New Zealand easier”. Qantas Group CEO, Alan Joyce, said the two national carriers had a lot of shared history as well as a shared goal of making travel easier. “Our relationship with Air New Zealand goes back almost 80 years,” he said. “We’ve been partners at various stages over that time and we have a lot of respect for them as a competitor. 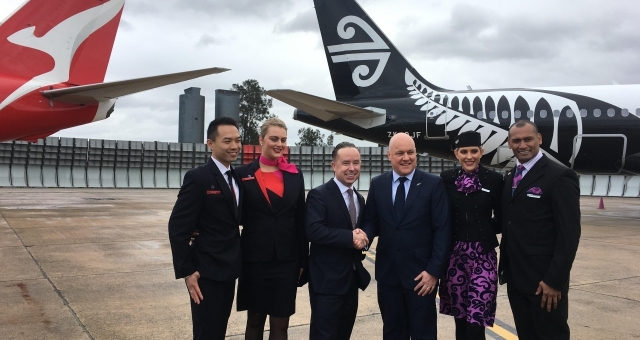 Air New Zealand Chief Executive Officer, Christopher Luxon, said the codeshare will see two of the world’s best airlines offer their customers a full service experience when they make domestic connections within New Zealand or Australia. The codeshare and customer offering will exclude Trans-Tasman and all other flights on the respective airlines’ networks and Qantas will continue to codeshare on all connecting Jetstar New Zealand services.